How were black people were treated in 1930s America? What halfwit came up with this question and its dumb-assed third option? In what way is this really testing 15 year old GCSE students? It simply reduces the questions to a 50:50 chance of getting them right. Why are we told about Jem's broken arm at the start of the novel when the attack does not occur until the end? a) To make us feel sorry for Jem. c) So that we know what happens if we don't have time to read the book. There's loads of these. Standards and BBC - an oxymoron? Piaget – why teach this stuff? Asked my niece, who’s doing teacher training (B Ed), what she’s getting in psychology and the first name that comes up is ‘Piaget’. My heart sinks as there’s almost nothing left of his theories that is remotely useful to a new teacher. His four-stage theory of child development has been so completely wiped out by subsequent studies, that there’s nothing left. It’s merely an exercise in the history of science. What’s shocking is the way he’s still revered and taught in such courses. It’s like teaching Lamarck, not Darwin. His famous four stage developmental model (Sensorimotor, Pre-operational, Concrete and Formal) has been fairly well trashed. First, the Sensimotor Stage with the infamous ‘hide a toy under a cloth and the child thinks it’s no longer there’ study, which turned out to be an exercise in distraction, and when repeated by Bower and Wishart in the absence of an adult, with a teddy, most children had no difficulty in understanding that the toy is still under the cloth. In general, Piaget simply focussed too much on motor actions when the real development is perceptual. Kagan also attributes object permanence to a simple increase in memory capacity. Second, the Pre-operational Stage study, where a child fails to recognise a doll’s point of view from photographs of three mountains, was shown to be too complex for the children to understand. A simpler experiment by Hughes, using dolls of two policeman, showed that many children can understand non-egocentric perspectives. Fourthly, the Formal Operative Stage focused to much on formal logic, ignoring many other mature cognitive skills. It’s as if we were all little mathematicians, not ‘little scientists’. In fact kids develop, not in a predictable, linear fashion, but in fits and starts, and in many different ways. All in all, the four stages were pretty much demolished and subsequent research has shown that development takes place much earlier than he had posited, is more of a continuum, with more variation in ages and more plasticity than was previously thought. How did he get it so wrong? Well, like Freud, he was no scientist. First, he used his own three children (or others from wealthy, professional families) and not objective or multiple observers to eliminate observational bias. Secondly, he often repeated a statement if the child’s answer did not conform to his experimental expectation.. Thirdly, the data and analysis lacked rigour, making most of his supposed studies next to useless. So, he led children towards the answers he wanted, didn’t isolate the tested variables, used his own children, and was extremely vague on his concepts. I wasn’t kidding when I compared him to Lamark, as his theories are mostly wrong and he offers nothing but descriptions of development without any real underlying explanations. This was his biggest weakness, failing to understand the mechanisms behind development. For him, kids just ‘do thing’ stripped of motivation, language development, memory development and so on. The good news is that his mistakes led to more rigorous studies that really did unravel child development, although one wonders why he is taught at all. The bad news is that the hole was filled by an even less rigorous and more flawed theorist, Lev Vygotsky. Don’t get me started on him! What's worrying is the fact that teachers are coming out with a fixed view of child development based on 'ages and stages' that are quite wrong. This leads to amateurish teaching methods and a lack of understanding of when and how to teach numeracy and literacy. The 'whole-language' teaching fiasco in primary schools was the perfect storm of this amateurish approach. The sad fact is that education and training is still soaked in this dated theory, as they suffer badly from 'groupthink'. The community literally thinks that theories are sound if a) they've been around for a long time (sorry, but in science, especially psychology, the opposite is true) b) everyone does it (that's precisely the problem). Reading Chris Anderson’s book FREE – The Future of a Radical Price, makes one think that these powerful principles could be applied in education and training. In fact, it already has. In 1991 the encyclopedia industry was worth an astonishing $1.2 billion, Britannica being the market leader with sales of $650 million. In 1993, Encarta was launched for $99 and in the same year Britannica laid off its door-to-door sales force. Within 3 years Britannica had dropped to $300 million and the overall encyclopedia market had shrunk to $600 million, of which Encarta had $100 million. So a cheaper price not only revolutionised this market, it decimated the market. Along came Wikipedia and the market shrunk again, with Encarta canned completely in 2009. The end result is a market where the cost to the learner is ZERO. However, the availability of free encyclopedic knowledge base, that is bigger, better, broader, in more languages than ever before won the day. The really interesting economic point is that the real money that would have been spent on expensive sets of rarely read Encyclopedias, can be spent elsewhere. It’s redistributed. We as customers get to keep our money a well as getting a better product. Now that lectures are being recorded, and distributed, often for free through YouTube EDU, iTunes U, Open Learn, MIT Courseware and others, anyone can have access to this level of instruction. See previous post. The advantages are obvious. In fact these recorded lectures, are in the end better than their live originals in all sorts of ways supported by the psychology of learning. Google and its many services has also given us access to a wealth of resources, especially in searchable print. Project Gutenberg and others have given us hundreds of thousands of free books. You pretty much get an answer to any question you pose. This is the tricky one, but formative feedback is improving greatly in online content, especially in simulations and games. There’s plenty of evidence to show that many learning tasks can be completed without teacher intervention. It’s simply a matter of designing top class content. Live teaching is not a necessary condition for learning. In fact it can be a condition for stopping learners from learning. If e can take some magical motivational dust from games and other media and apply it to learning, we’ll make great gains. At some time in the future, the technology will be able to provide free assessment. Let’s face it, current types of assessment in education and training are often fairly crude. It’s no great stretch of the imagination for it to be largely automated. The first problem is unique identification. Iris scanning, fingerprints, digital photographs and other cheap techniques will make this very cheap. As for delivery, the online delivery of assessments, which avoid leaks, can be varied from person to person and really does provide high quality assessment, is already possible. This frees people up to take the assessment when they’re ready, and not just when it’s convenient for the organisation. It’s about attainment not attendance. I, for one, am already a ‘free learner’. I don’t go on courses, don’t use teachers, yet learn daily online (and offline). I know from the many other people I encounter online that we all read, click on links, use reference material, do academic research, email, blog, Facebook, Tweet to improve our knowledge and skills. The future is free. A new study has looked specifically at the impact of web use in older subjects. A fMRI-based study from UCLA has just been presented by Teena Moody in Chicago at the Society for Neuroscience, which took scans from 24 normal 55-78 year olds. It showed significant increases in brain activity patterns and increased function after just seven one hour sessions on the web over seven days. The control was the group who did no web activity. “The first scan of participants with little Internet experience showed brain activity in the regions controlling language, reading, memory and visual abilities. 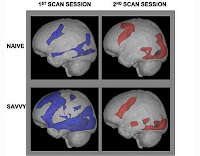 The second brain scan of these participants, conducted after the home practice searches, demonstrated activation of these same regions, but there was also activity in the middle frontal gyrus and inferior frontal gyrus – areas of the brain known to be important in working memory and decision-making. “The results suggest that searching online may be a simple form of brain exercise that might be employed to enhance cognition in older adults.” says Moody. What’s fascinating about brain scanning research, is the possibility of identifying optimal learning techniques. For example, what type of internet activity leads to highest levels of desirable cognitive activity and improvement? Universities, in their current guise, have become closed, inward-looking, traditional, elitist institutions. Shut for much of the year, empty buildings, three lectures a week, poor teaching – the current financial squeeze will hopefully force us to re-examine the model. Imagine a world in which some universities simply opened their doors to learners, even offering courses for free. There are signs that such a paradigm shift may be happening on the web. Suddenly a huge amount of good content is available on the web, for free, as some of the biggest brands on the web act as conduits for higher education content, with hefty foundation grants paying the bill. Simple enough, video lectures with ratings and details of number of downloads, from over 320 Universities such as; Oxford, Cambridge, Harvard, Berkeley, Carnegie Mellon, Stanford,, and so on. Cambridge, Coventry, Edinburgh, Leeds, Nottingham, OU, The top lecture has received 10.5 million views! But even physics lectures are beating the 350,000 mark. Compare this with the once a year, lecture from a typical living academic – let’s say 100 students once a year for 15 years (and that’s really pushing it). You’re effectively extending the life of a good physics lecturer by thousand of years! 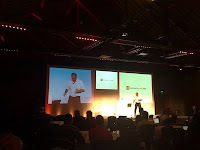 YouTube lectures can be public or private, structured as playlists embed on your site or show on a mobile phone. YouTube Insight gives you loads of useful stats on; views, referrals, gender, age, geography. Like YouTube EDU, iTunes U is all free content, currently at 200,00 audio and video items, from major Universities. You can download all the tracks on a specific topic or just one. You can also subscribe to receive new stuff automatically. Top downloads – Intensive English, Introduction to Mac OS, Building a Business, beginners’ French etc. One distinct advantage is that you can play audio or video on your iPod, iTouch, iPhone, MP3 player, Mac or PC. iTunes U Reports give you lots of stuff on downloads, unique users and so on. Open Learn is the OUs Moodle based system is much more sophisticated on support for learners with its learning tools, knowledge maps, shared activities and activity reports. All you need do is register with a personal profile. The content and forums are then available for group discussions, you can do the self-assessment, where you answer questions, then compare your answers with model answers. You can rate and review units, create a learning journal and use Learning Space to organise your study. Pretty impressive. That guy Walter Lewin, physics lecturer, is at the top of the downloaded courses with his Physics 1 Classical Mechanics lecture with its subtitles/transcript, lecture notes, assignments/solutions and exams/solutions. More of him later. The stats are astounding 40 million visits by 31 million people from almost every country in the world. The majority view this stuff for personal learning 62%. Overall the breakdown is 49% self-learners, 32% students, 16% educators. The ‘free’University , yes ‘free’. Just started this year but puts forward a model that may be ideal for the developing world (see my previous post). A growing resource of ‘Open books for an open world’ are available with the usual wiki functionality of discussion, source and history for each book. There’s also print-ready and PDF books available. At 2.5 million downloads per month, Project Gutenberg is starting to motor. What’s interesting is the eclectic nature of the downloads. The top ten contains fiction such as Alice in Wonderland, Pride and Prejudice, but also a science book, the Kama Sutra and a book on the history of Furniture. They also have their famous ‘Distributed Proofreading’ system, where volunteers proofread e-books, a page a day. The greatest single, searchable store of knowledge on the planet and growing still. It’s a miracle of the web, and I’d personally give Jimmy Wales the Nobel Prize for knowledge dissemination. Who doesn’t use this thing? It’s wonderful beyond belief. Who cares if a few errors are noted, they’re soon fixed. It quite simply the greatest knowledge sharing show on earth. OER (Open Education Resources) is a rapidly growing movement with the not-for-profit OER Foundation launched last month on the back of a $200,000 grant from the Hewlett Foundation and support from the Learning4Content project. The Cape Town Open Education Declaration is up and running, a sort of manifesto for future development. The Opencast Community site has a wealth of information on podcasting in Higher Education. The Matterhorn project is of real interest with $1.3 million from the Mellon and Hewlitt Foundations to develop software that will schedule, capture, encode and deliver audio and video content to the likes of YouTube EDU and iTunes U. Should be ready by summer 2010. WkiEducator is one of many communities operating in the field, where you can join, and create free content. They promise to ‘turn the digital divide into digital dividends’. So how is all of this funded? Well, there’s a number of sources; foundations, most notably, The William and Flora Hewlett Foundation, institutions themselves, free contributions, donations and payment. The foundation money (mostly from private sector benefactors) tends to seed the initiative, which then gains momentum either in a University or community. The real progress comes when you get a slingshot effect from altruistic contributors (as in Wikipedia). Recorded lectures – better learning? Are Youtube video lectures better than the real thing? I think the evidence is in the video themselves. In the cutaways to the audience you see some students attention wander and always towards another student. You don’t have that distraction in your own company. Lewin understands and explains at the start of his lecture series, that lectures complement other forms of study. He is NOT lecturing the book. It’s about demonstrating physics, selling physics, exciting people about physics. It’s about motivation, as well as understanding. What I love about Walter Lewin is his style – he walks around, he shouts, he gesticulates, he demonstrates, he stands up on his desk, gets students up, he quips – he’s a livewire. He does the very opposite of playing that ‘I’m an academic and have to be serious, grave and dull’ routine. Attendance was not significantly affected by webcasts, even given the limited degree to which some students repeatedly substituted webcasts for attending class. Students perceived webasts to be a helpful tool for learning, but the impact of webcasts on their performance in terms of grades and test scores is not clear. Students used webcasts for learning benefits (e.g., reviewing course content) and psychological benefits (e.g., anxiety reduction, course satisfaction). A majority of students watched webcasts at least once, typically 1-7 times, before exams or 1-3 times a month, at night from home through high-speed connections. Most students watched the entire lecture and typically they both listened to the lecture and watched videos and slides. Female students and students who cared about their course grades perceived webcasts as more beneficial than did male students or those who did not care about their grades respectively. Also, those with certain difficulties non-native speakers of English, students with a learning disability, and students with difficulty in understanding the professor’s speech) did not report benefits from webcasts, contrary to our expectations. Students rated most current and future webcast interface features as important, in particular stop/rewind (current feature), scan (current feature), manipulating the slides or video window (current feature), and better quality or full screen animation/video (future feature). Students and instructors were generally satisfied with webcasts’ quality and did not experience many technical problems. Many problems they did report can be resolved through training of instructors, students, and camera operators. Both students and instructors in general indicated that webcasts were good supplemental learning resources but not a substitute for attending class. The results presented here now further extend the benefits of the cyber classroom by demonstrating a significant improvement in student outcomes as assessed by final grades with a nearly half grade improvement in mean grades, a 56% drop in failing grades, and a 36% increase in grades B+ and above. Another comes from ICTP in Trieste, who have been using recorded lectures for some time. Assessed learning improves, students watch 2 hours per night after live daytime lectures and even watch lectures from other courses they’re not taking. Some years back I gave a talk in Glasgow, and behind me was a huge banner saying, “Scotland, healer, educator to the world”. It was embarrassing hubris, but the myth still persists that Scotland is somehow, a leader in learning. This week I gave a talk at the Royal Society of Scotland in Edinburgh, and the mood was far more realistic, but maybe more worrying. Hugh Trevor-Roper’s ‘The Invention of Scotland’ literally scotches three myths; political, literary and sartorial. Celtic nations are good at mythologizing. We made up a list of fictitious Kings to fill in the gaps, forged documents to prove it, wrote fictitious poetry in an attempt to create a Scottish Homer (Ossian) and the kilt and its accessories was invented by an English Quaker (Thomas Rawlinson) for workers in his Highland factory. It is a “purely modern costume…to bring them off the heath and into the factory”. Kilts were never worn by the clans and neither were clan-specific tartans. The Late 18th century Romantic movement, formation of Highland regiments (to suppress the Highlands and fight abroad), a visit by George IV and Queen Victoria all helped create the myth of a ‘tartanised’ Scotland. Trevor-Roper describes Scotland as a mythologizing nation, keen to invent a history that often doesn’t exist, and uncovers the long list of forgers and fantasists who helped create that myth. He was said to have been working on a fourth myth. We don’t know what that was. It could have been sport, we never did invent 'Golf', nor 'Curling', nor any other sport for that matter. Even the Highland Games were a mid-19th century concoction, as well documented in Grant Jarvie's Highland Games: The Making of the Myth. As for the bagpipes, Nero played the damn things and they existed in Europe, Ireland and Northumbria long before their appearance in Scotland. Again, it was the Highland Regiments and their colonial exploits that spread the myth. The fourth myth could have been 'finance' but the broadsword has been taken to RBS and HBOS, Fred Goodwin has been exposed as a greedy half-wit and the myth has evapourated as quickly as Scotch mist. Interestingly, both Goodwin and Cummings (HBOS) were the product of the Scottish state schooling system. My guess is that it was the ‘education’ myth. So I did a little analysis myself. It is still widely believed that Scotland has a superior educational system. Well, despite the favourable Barnett formula, kicked off in 1979, described in a recent 2009 inquiry as ‘arbitrary and unfair’, that gives every Scot £1,644 more than England, the system is not performing. We can expect changes on this front soon, as the Conservatives have nothing much to gain North of the border, and the SNP would rather push for nationalism at the expense of revenue. Salmond said as much at his conference this week where he looked forward to a 'hung parliament' where, and I quote, "Westminster would dance to a Scottish tune". The 2007 OECD (PISA) assessment showed that despite a doubling in spend over the decade of devolution, improvement was marginal, a similar result to England. In fact, Scotland slipped in Maths, English & Science and its PIRLS (Reading/literacy) rating stands at 21st , down from 14th), six places behind England. Even worse, Scottish students don’t like school one bit. Only 65% said they liked being at school (near the bottom of the survey). Scottish schools are torn apart by sectarian policies (faith schools in Scotland mean Catholic schools), a wasted sixth year and in some places social problems and division (in Edinburgh 25% of students go to private school). Like every developed nation, in the wake of the financial crisis and squeeze on public spending will hit Scotland hard. There are several ways in which the public finances will be squeezed. First a reduced Barnett formula, secondly slower growth leading to lower tax base, thirdly the persistent problem of low productivity, fourthly the dependence on financial jobs which are due to be culled or moved south, fifth dependence on public sector employment (23.6% employed in public sector compared to 19.1% in England, 56% of economic activity flowed from public economy compared to 43% across UK). I agree with OECD Secretary General Angel Gurría when he says, "optimising policy choices" and improving the overall management of education institutions” and "Investments in education will need to become much more efficient." Scotland continues to issue bellicose and belligerent statements to Westminster. This is perfectly compatible with Scottish nationalism (as voted in by the Scottish people). Salmond and Swinney may simply be driving the nationalist wedge more deeply, accepting a poorer Scotland as the price one pays for separation. That, in my view, would be tragic. Professional educators assume that everyone wants to be part of an institution, signing on for courses and getting accredited. In practice most adult learning is precisely the opposite. In my 25 years of designing and delivering training into large organisations, very few had any form of accreditation. What mattered was whether people learned or not. I like using these resources but have no interest in attending these institutions or getting another degree. Perhaps we need a rethink around the whole idea of the desirability of degrees. There has been a huge surge in degree getting, yet it is not clear that this is desirable. New learners understand the importance of quality and sharing. Universities don’t really get this. They rarely collaborate and share and this results in massive levels of duplication, with every lecturer inventing their own course. Why attend your own institution’s lectures when you can get world-class lectures from MIT fro free? The technology is allowing students to access top-class content by using the technology. Of course, the Universities who have gone down this route have much to gain. Many see this as a valuable marketing awareness tool. It’s no accident that the ‘money-smart’ top tier has been generous with its content. They are confident enough in their brand to make this move. What’s interesting about the funding of much of this is that it ultimately comes from the private sector, especially The William and Flora Hewitt Foundation (of Hewlitt Packard fame). To be fair the contributing Universities contribute greatly through the delivery of content. This philanthropic activity from both sources is heartening. So are we on the cusp of an era where the drunken meander through a 3 or 4 year degree becomes increasingly anachronistic? Couldn’t a University just offer assessment with no teaching? Why can’t I learn on my own, or with others, then simply get assessed by an organisation, rather than hanging around for years in crap lectures and student union bars? Why don’t Universities allow year round access for online students? Why do they close down for so long every year? 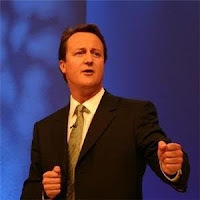 David Cameron singled out Education in his speech today as the first firestorm in his Bonfire of the Quangos. BECTA and the QCDA were actually named, which was astonishing in itself, but the intent is clear. In their first 100 days educational quangos will be decimated. To be fair the whole sector has become Byzantine with dozens and dozens of organisations overlapping, checking on each other. It's become a massive mess that is confusing for industry and learners. Rather than being sensible in culling organisations they've been allowed to multiply out of control. The danger is that the good get mixed up with the bad in the clear out.